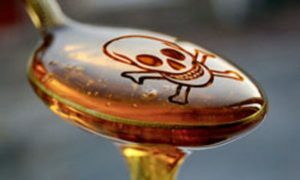 Sugar Truths – Is Sugar Addictive? Is sugar addictive? If so, is it the glucose or fructose portion? What is the mechanism of addiction? The processed sugars/high fructose corn syrup are the real issue. Hepatic fructose metabolism is different. Chronic Fructose exposure promotes metabolic Syndrome. Glucose and naturally produced fructose metabolizes different than high fructose corn syrup and added sugar. In glucose metabolism, when Citrate is shuttled out of the cell because not all the Acetyl CoA was utilized, which creates a very tiny amount VLDL. This signals the brain to stop eating; this is a normal and healthy process. In high fructose corn syrup, this feedback loop fails to occur because there is no leptin stimulation, causing the body to still think that it is hungry. Naturally occurring fructose, like in fruit and sugar cane is always accompanied by copious amounts of fiber. Therefore, in its natural state, fiber acts as the satiety signal, where fructose does not. Fiber also moves fructose through the gut quicker, which limits its absorption rate. What are the metabolic fates of fructose? What controls each? A small amount of fructose into glycogen, while the rest gets processed as a byproduct. The worst of these byproducts is VLDL. It is mainly made of a triglyceride (fat) which is bound to the VLDL. Fructose is metabolized like a fat. Would sugar explain all cases of obesity or just a subset of individuals? Sugar is a culprit but not the cause of all obesity. Added sugar and high fructose corn syrup play a role in a lot of cases, perhaps inhibiting our bodies response to leptin and satiety, causing us to overeat. In chronic dosages, it also causes severe stress on the liver, and a whole host of health problems including hypertension, cardiovascular disease and metabolic syndrome. High fructose corn syrup literally processes exactly like alcohol, meaning its actually processes like fat. What proportion of sugar (glucose and fructose) end up stored as fat in adipocytes? (You may want to go back and review glucose & fructose metabolism from your Nutritional Science course) What affects this? Do we really know? If so, can you show me the data? Sugar is metabolized in your body both as a carbohydrate and as a fat. Upon entering the digestive tract, sugar breaks down into fructose and glucose. Glucose starts out as a carbohydrate and a little bit is stored as fat. Where fructose is metabolized through your liver, and mostly converted to a fat. Glucose: About 20% is stored as glycogen in your muscles and liver. The remainder of the glucose, goes to the bloodstream to serve all cells in your body. Fructose: Can only be processed by the liver. Therefore your liver processes 100% of the fructose. A tiny amount turns into liver glycogen, while the rest get’s turned into VLDL which is the cause of heart disease. Some communities and groups are proposing and implementing soda and sugar taxes as a disincentive to consume sugar – Is this good nutrition policy? This is equivocal to making drugs illegal or taxing tobacco. If people are addicted, they will will pay whatever it costs. Plus the tax is so insignificant that it won’t stop people. Education is a much better approach. That being said, taxing high fructose corn syrup is a band-aid on a gaping wound, and it will not stop people from over consuming.